Despite her hard-knock life, little Quvenzhane Wallis sees sunshine in every tomorrow. 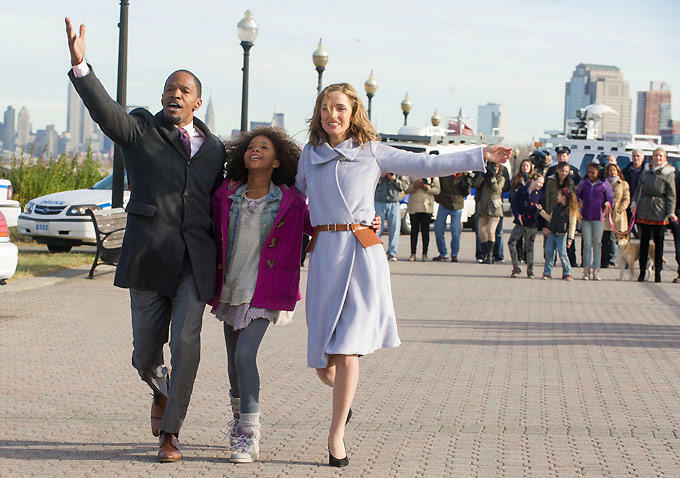 Jamie Foxx woos audiences on each and every corner of NYC with his likable expressions and a voice like butter, but it’s Rose Byrne who knows she’s never fully dressed without a smile and helps charm little Annie into thinking she’s gonna like it here. Cameron Diaz takes easy street as a surprisingly believable Ms. Hannigan, the evil caretaker for the all the little girls and former member of C+C Music Factory. Maybe Annie will seize the opportunity to find her family, but most likely she will figure out that she doesn’t need anyone but you! This remake was darling, vastly more entertaining and enjoyable than I ever expected it to be. So good to know! I can’t wait to go see it!